Monolayer (ML) transition metal dichalcogenides (TMDCs) are thought to be highly promising materials for the optoelectronic and nanophotonic applications. However, the low absorption cross section and photoluminescence (PL) quantum yield in such atomically thin layers restrict their applications. Considering that the energy transfer in a heterostructure can modulate TMDCs’ optical properties, a type I heterostructure geometry comprising ML TMDCs and lead halide perovskite quantum dots (QDs) has the potential to overcome these shortcomings. In this work, spin-coating the CsPbBr3 QDs on ML WS2 results in ~12.7 times enhancement in the PL intensity of ML WS2 at 295K. This giant enhancement is attributed to the energy transfer process from CsPbBr3 QDs to WS2 with a ~40% energy transfer efficiency and ~2 × 108 s−1 energy transfer rate. Besides, we observed that the internal quantum efficiency of ML WS2 is increased from 6.35% to 29.01%. The result demonstrates the feasibility of using perovskite QDs and ML TMDCs to form a type I heterostructure and improve the performance of the TMDC-based optoelectronic devices. X. Xu, W. Yao, D. Xiao, and T. F. Heinz, “Spin and pseudospins in layered transition metal dichalcogenides,” Nat. Phys. 10(5), 343–350 (2014). 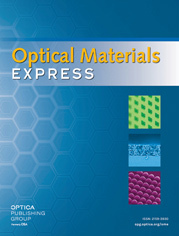 Q. H. Wang, K. Kalantar-Zadeh, A. Kis, J. N. Coleman, and M. S. Strano, “Electronics and optoelectronics of two-dimensional transition metal dichalcogenides,” Nat. Nanotechnol. 7(11), 699–712 (2012). C. Ruppert, A. Chernikov, H. M. Hill, A. F. Rigosi, and T. F. Heinz, “The role of electronic and phononic excitation in the optical response of monolayer WS2 after ultrafast excitation,” Nano Lett. 17(2), 644–651 (2017). V. Vega-Mayoral, D. Vella, T. Borzda, M. Prijatelj, I. Tempra, E. A. A. Pogna, S. Dal Conte, P. Topolovsek, N. Vujicic, G. Cerullo, D. Mihailovic, and C. Gadermaier, “Exciton and charge carrier dynamics in few-layer WS2.,” Nanoscale 8(10), 5428–5434 (2016). W. Zhao, Z. Ghorannevis, L. Chu, M. Toh, C. Kloc, P.-H. Tan, and G. Eda, “Evolution of electronic structure in atomically thin sheets of WS2 and WSe2.,” ACS Nano 7(1), 791–797 (2013). X. Fu, J. Qian, X. Qiao, P. Tan, and Z. Peng, “Nonlinear saturable absorption of vertically stood WS2 nanoplates,” Opt. Lett. 39(22), 6450–6453 (2014). T. Cao, G. Wang, W. Han, H. Ye, C. Zhu, J. Shi, Q. Niu, P. Tan, E. Wang, B. Liu, and J. Feng, “Valley-selective circular dichroism of monolayer molybdenum disulphide,” Nat. Commun. 3, 887 (2012). O. Lopez-Sanchez, D. Lembke, M. Kayci, A. Radenovic, and A. Kis, “Ultrasensitive photodetectors based on monolayer MoS2.,” Nat. Nanotechnol. 8(7), 497–501 (2013). G. Eda, H. Yamaguchi, D. Voiry, T. Fujita, M. Chen, and M. Chhowalla, “Photoluminescence from Chemically Exfoliated MoS2.,” Nano Lett. 11(12), 5111–5116 (2011). A. Venkatakrishnan, H. Chua, P. Tan, Z. Hu, H. Liu, Y. Liu, A. Carvalho, J. Lu, and C. H. Sow, “Microsteganography on WS2 monolayers tailored by direct laser painting,” ACS Nano 11(1), 713–720 (2017). O. Salehzadeh, N. H. Tran, X. Liu, I. Shih, and Z. Mi, “Exciton kinetics, quantum efficiency, and efficiency droop of monolayer MoS2 light-emitting devices,” Nano Lett. 14(7), 4125–4130 (2014). K. C. J. Lee, Y.-H. Chen, H.-Y. Lin, C.-C. Cheng, P.-Y. Chen, T.-Y. Wu, M.-H. Shih, K.-H. Wei, L.-J. Li, and C.-W. Chang, “Plasmonic gold nanorods coverage influence on enhancement of the photoluminescence of two-dimensional MoS2 monolayer,” Sci. Rep. 5, 16374 (2015). Y. Li, Z. Qi, M. Liu, Y. Wang, X. Cheng, G. Zhang, and L. Sheng, “Photoluminescence of monolayer MoS2 on LaAlO3 and SrTiO3 substrates,” Nanoscale 6(24), 15248–15254 (2014). M. K. L. Man, S. Deckoff-Jones, A. Winchester, G. Shi, G. Gupta, A. D. Mohite, S. Kar, E. Kioupakis, S. Talapatra, and K. M. Dani, “Protecting the properties of monolayer MoS2 on silicon based substrates with an atomically thin buffer,” Sci. Rep. 6(1), 20890 (2016). K. Wu, G. Liang, Q. Shang, Y. Ren, D. Kong, and T. Lian, “Ultrafast interfacial electron and hole transfer from CsPbBr3 perovskite quantum dots,” J. Am. Chem. Soc. 137(40), 12792–12795 (2015). V. K. Ravi, G. B. Markad, and A. Nag, “Band edge energies and excitonic transition probabilities of Colloidal CsPbX3(X = Cl, Br, I) perovskite nanocrystals,” ACS Energy Lett. 1(4), 665–671 (2016). L. Protesescu, S. Yakunin, M. I. Bodnarchuk, F. Krieg, R. Caputo, C. H. Hendon, R. X. Yang, A. Walsh, and M. V. Kovalenko, “Nanocrystals of cesium lead halide perovskites (CsPbX3, X = Cl, Br, and I): novel optoelectronic materials showing bright emission with wide color gamut,” Nano Lett. 15(6), 3692–3696 (2015). Y. Zhang, Y. Zhang, Q. Ji, J. Ju, H. Yuan, J. Shi, T. Gao, D. Ma, M. Liu, Y. Chen, X. Song, H. Y. Hwang, Y. Cui, and Z. Liu, “Controlled growth of high-quality monolayer WS2 layers on sapphire and imaging its grain boundary,” ACS Nano 7(10), 8963–8971 (2013). H. Zeng, G.-B. Liu, J. Dai, Y. Yan, B. Zhu, R. He, L. Xie, S. Xu, X. Chen, W. Yao, and X. Cui, “Optical signature of symmetry variations and spin-valley coupling in atomically thin tungsten dichalcogenides,” Sci. Rep. 3, 1608 (2013). C. Gong, H. Zhang, W. Wang, L. Colombo, R. M. Wallace, and K. Cho, “Band alignment of two-dimensional transition metal dichalcogenides: application in tunnel field effect transistors,” Appl. Phys. Lett. 103(5), 053513 (2013). M. Z. Bellus, M. Li, S. D. Lane, F. Ceballos, Q. Cui, X. C. Zeng, and H. Zhao, “Type-I van der Waals heterostructure formed by MoS2 and ReS2 monolayers,” Nanoscale Horiz. 2(1), 31–36 (2017). K. Wei, X. Zheng, X. Cheng, C. Shen, and T. Jiang, “Observation of ultrafast exciton–exciton annihilatioN in CsPbBr3 quantum dots,” Adv. Opt. Mater. 4(12), 1993–1997 (2016). F. Prins, A. J. Goodman, and W. A. Tisdale, “Reduced dielectric screening and enhanced energy transfer in single- and few-layer MoS2.,” Nano Lett. 14(11), 6087–6091 (2014). L. Yuan and L. Huang, “Exciton dynamics and annihilation in WS2 2D semiconductors,” Nanoscale 7(16), 7402–7408 (2015). C. Cong, J. Shang, X. Wu, B. Cao, N. Peimyoo, C. Qiu, L. Sun, and T. Yu, “Synthesis and optical properties of large-area single-crystalline 2D semiconductor WS2 monolayer from chemical vapor deposition,” Adv. Opt. Mater. 2(2), 131–136 (2014). G. L. Frey, R. Tenne, M. J. Matthews, M. S. Dresselhaus, and G. Dresselhaus, “Optical properties of MS2 (M = Mo, W) inorganic fullerenelike and nanotube material optical absorption and resonance Raman Measurements,” J. Mater. Res. 13(9), 2412–2417 (1998). S. H. Aleithan, M. Y. Livshits, S. Khadka, J. J. Rack, M. E. Kordesch, and E. Stinaff, “Broadband femtosecond transient absorption spectroscopy for a CVD MoS2 monolayer,” Phys. Rev. B 94(3), 035445 (2016). F. Ceballos, M. Z. Bellus, H.-Y. Chiu, and H. Zhao, “Ultrafast charge separation and indirect exciton formation in a MoS2-MoSe2 van der Waals heterostructure,” ACS Nano 8(12), 12717–12724 (2014). Fig. 1 Characterization of ML WS2 and CsPbBr3. (a) SEM image of the ML WS2 in lighter color. (b) Typical Raman spectra of the ML WS2 under 457 nm laser. (c) AFM of the ML WS2 showing a height less than 1 nm. (d) PL spectra of ML WS2 flake and CsPbBr3 QDs (0.1 mg/ml) on sapphire plates for different incident power of 405 nm laser. (e) Statistical distribution of the length along the CsPbBr3 long edges. The average length of the long edges is about 11.07 nm. The inset picture is TEM image of the CsPbBr3 QDs. (f) Schematic of theoretically predicted band alignments of CsPbBr3/WS2 heterostructure and possible charge separation, transfer and recombination pathways. The gray dashed line represents the mid-gap states. The straight upward arrows (purple) represent the excitation by 405 nm laser. Those straight downward arrows (red) represent the radiative recombination. All the measurements were carried out at 295K under ambient atmospheric conditions. Fig. 2 Characterization of the isolated ML WS2 and ML WS2 covered by CsPbBr3 QDs with a concentration of 0.5 mg/ml. (a) AFM image of the CsPbBr3/WS2 heterostructure. (b) Raman spectra of isolated ML WS2 and CsPbBr3/WS2 heterostructure under 457 nm CW laser. The laser can excite both the WS2 and CsPbBr3. (c) Typical PL spectra of an isolated ML WS2 and CsPbBr3/WS2 heterostructure under different incident powers of 405 nm laser. The magenta line represents the isolated WS2 PL signal after multiplying 5. All the measurements were carried out at 295K under ambient atmospheric conditions. Fig. 3 PL decay curves of isolated CsPbBr3 QDs and CsPbBr3 QDs in heterostructure under 405 nm pulse laser for different excitation fluence in air. The gray lines are the IRF of the system with a resolution (FWHM of IRF) about 300 ps. Fig. 4 Transient absorption (TA) spectra of WS2, CsPbBr3 QDs and CsPbBr3/WS2 heterostructure upon excitation at 3.1 eV with a fluence of 160µJ cm−2 at 295 K. (a) and (b) 2D plots of TA from WS2 and CsPbBr3/WS2 heterostructure, respectively. (c) TA spectra for isolated WS2, CsPbBr3 QDs and CsPbBr3/WS2 heterostructure at 700 fs pump-probe delay. (d) Evolution of TA signals at the WS2 A-exciton resonance in isolated WS2 and CsPbBr3/WS2 heterostructure. Table 1 Fitting results of the TA kinetics resonance in isolated WS2 and CsPbBr3/WS2 at WS2 A-exciton. (1) η ET =1−( τ DA / τ D ). (2) k ET = τ DA −1 − τ D −1 . Fitting results of the TA kinetics resonance in isolated WS2 and CsPbBr3/WS2 at WS2 A-exciton.